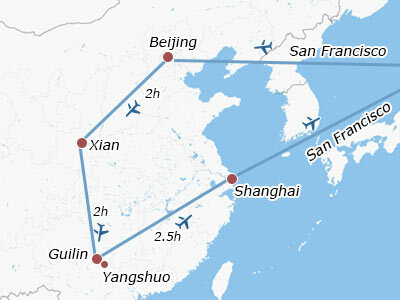 With about 12.5 hours duration time, almost 2 to 3 direct flights operate daily between San Francisco and Beijing. Our travel consultant will contact and inform you of the flight departure time from San Francisco International Airport before the trip. Please catch the flight to Beijing by yourself on that day. 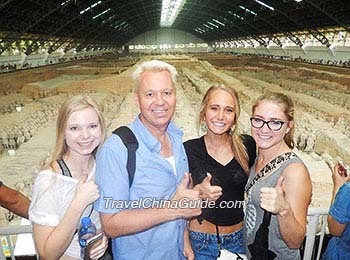 Upon landing at Beijing airport, you will meet our experienced guide and driver outside the customs. After a warm greeting, we will transfer you to the hotel for check-in. 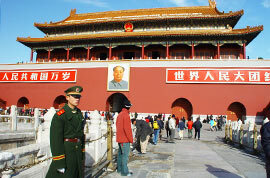 At the very beginning of this private China tour from San Francisco, we will come to Tiananmen Square to admire its solemnity and majesty. 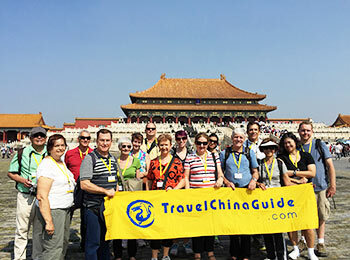 Then, enter the Forbidden City from the Meridian Gate to appreciate the fabulous masterpiece of ancient architecture. There the richly adorned palaces with encaustic tiled rooftops and brightly painted red walls would be the highlight of the day. Later, an a la carte welcome lunch with the famous Peking Duck will be served in a nice restaurant. After that, a comfortable transfer will take you to the grand Temple of Heaven, which was used for worshipping gods and praying for a good harvest during the Ming and Qing dynasties (1368 - 1911). In the evening, you will enjoy a wonderful Chinese Kung Fu Show at the Red Theatre. 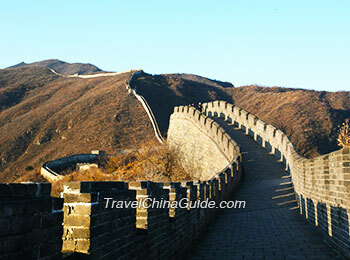 Today we will take a morning excursion to Mutianyu Great Wall - one of the top ten must-see sites in Beijing. After alighting from the vehicle, board the round trip cable car to view the great scene of Mutianyu winding and zigzagging among lofty mountains. We will then propose a toast with red wine after ascending the Great Wall. Lunch is not included in our price, and the food there doesn't taste good. Hence, it is advisable to have a big breakfast at the hotel or prepare some snacks before departure. 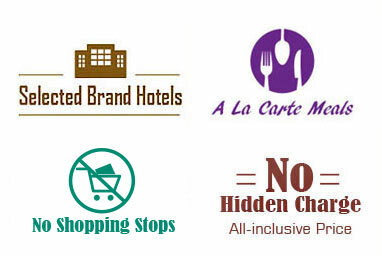 The guide will be willing to recommend some restaurants if you need. Afterwards, you will be taken back to downtown. On the way, you will have a short stop near the Olympic National Stadium to view the unique appearance of the Bird Nest at a distance. Then, there is a popular local market expecting your visit. After breakfast, a private ride will drive you to the Summer Palace, which enables you to appreciate the pretty scenery with mountains and rivers of Longevity Hill and Kunming Lake. Next, a classic Hutong Rickshaw tour follows, and you can also enjoy yourself while joining the interesting activity of Chinese Paper Cutting after experiencing the rich culture of old Beijing in the time-honored Hutongs. In the afternoon, the guide will send you to the airport and help you with the boarding procedures. This China tour from the United States will progress to Xi'an. After your landing at Xianyang International Airport, you will then be transferred to check in at the hotel. Today we will tour the Terracotta Army during the whole morning. It was built about 2,200 years ago to guard the resting place of Emperor Qin Shi Huang after his death. You would be amazed at the organized battle formation composed of lively pottery figures and horses underground. Next, a visit to a local family will be arranged, and you can taste the home-made Chinese food. If you are interested, you can also learn to cook one or two dishes from the host with our guide's help. After lunch, continue our China tour from San Francisco to see the Small Wild Goose Pagoda and the adjacent Xi'an Museum in succession. In the evening, we will entertain you with special dumpling dinner and the brilliant Tang Dynasty Music and Dance Show. After breakfast, our guide will accompany you to stroll in the City Wall Park and observe the morning relaxing life of the locals. You can learn how to do Tai Chi if interested. 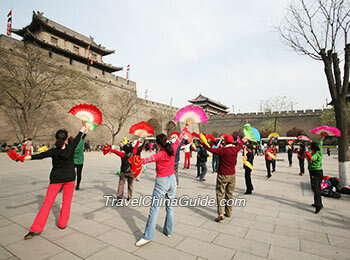 Then, you will be led to the old Xi'an City Wall. Taking a leisure walk or cycling along the city walls are both recommended. The bike rental fee is at your own expense. In the afternoon, we will head for the Shaanxi History Museum to admire a large amount of pieces of precious stones, jades, gold & silver ornaments on exhibition. Later, after viewing the unique Great Mosque, a stroll around the bustling Muslim Quarter full of delicious delicacies will round off the day. 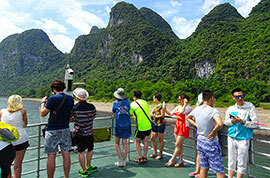 This morning you will be escorted to the airport and fly to Guilin. 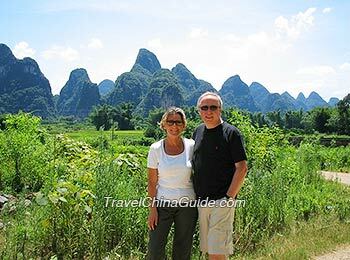 After your landing, the guide of the following Guilin tour from San Francisco will warmly greet you and chauffeur you to the hotel. In the afternoon, accompanied by our guide, you will reach the Reed Flute Cave, and many beautiful stalagmites, peristeles as well as stone flowers will dazzle your eyes with their unique exquisiteness and gorgeousness. Next, pay a visit to the Elephant Trunk Hill, which looks like a big elephant drinking water by the river with its trunk. 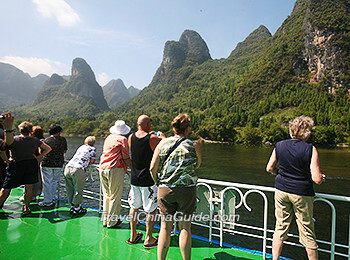 Today we will travel to Yangshuo by cruising along the captivating Li River to absorb the essential landscape of Guilin. Observe the graceful reflections of the continuous green hills on placid water and immerse in the scenic views along both banks, you would feel like being inside a beautiful picture. After about the 4.5 hours cruise journey, you will be guided to see the ancient buildings of China in West Street. After that, we will go to the countryside of Yangshuo to have a look and visit a local villager's home en route. At last, return to the downtown hotel in Guilin. Tips: Today you will have a simple Chinese lunch box on the cruise, which is not up to our standard. Hence we suggest you have a hearty breakfast in the morning or prepare some snacks for lunch. After checking out this morning, you will be escorted to take a flight to Shanghai - the last city we will visit during this China tour from USA. After meeting our guide and driver at Shanghai airport, you will be taken to the hotel for good rest. Please feel free to explore the surroundings later. Today's Shanghai trip will start with the Shanghai Museum. There are lots of fine cultural relics of bronze wares, calligraphy works and paintings to be seen. 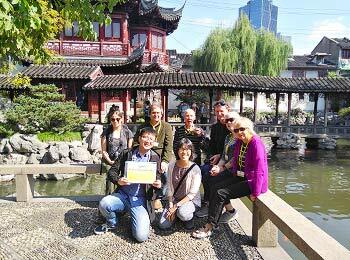 When getting out from the museum, we will go to Yu Garden boasting the pearl of the classical gardens in southern China and then its traditional bazaar to have a look. After having an a la carte farewell lunch, we will watch the fancy foreign-style houses in Former French Concession. Next, a further visit to the Bund will be scheduled, and you are able to see renowned landmarks of Shanghai rising loftily on the bank of the Huangpu River. Finally, enjoy the dazzling night views of the city by a relaxing Huangpu River cruise. Your 12 days China tour from America will conclude today. After breakfast, you can reach the airport for your homeward flight by taxi for around 1.5 hours. It would cost CNY150 or so cab fare if you take any one of the four 11-hour direct flights from Pudong Airport (PVG) to San Francisco. Bon Voyage! Thank you for arranging such a FANTASTIC experience.The guides were friendly and knowledgeable and spoke excellent English. We especially found Candy (Beijing), Lily (Xian), Lee (Guilin) particularly engaging and fun to be with. These three ladies were the guides who truly went over and above and made our stay in those locations particularly enjoyable. The drivers were prompt, courteous and kept their vehicles clean. We would recommend that a cooler is kept in the trunk so that cold water can be served to Westerners (who prefer cold water). The service and program on this tour far exceeded my already high expectations. Very well-organized with an extremely knowledgeable guide. 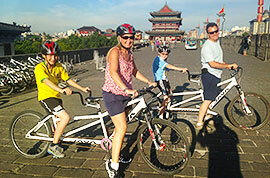 I came to sightsee with a primary desire to learn of the history, culture and people of China. To this end, it exceeded my expectations and I am coming away with a much greater appreciation of China and its people! There are so much to see at each city, I think Tina and Maggie’s organization did a wonderful job planning and scheduling events for each city. I know we didn't spend too much time per each sightseeing spots. However, I believe tourists understand we have tied schedule and lots to see so If people wants to have more time, they have to sign up for a longer itinerary. I think this company is doing a great job. I think all the meals are great. There were always foods left over and most meals were very tasty. In Beijing, the restaurant was not my favor because the service wasn't good. Also, my daughter doesn't eat meat and I wish the arrangement for her could have been better. Our favorite restaurant for the one that our guide took us in Guilin. Lu was our guide and she took us to a noodle/dumpling restaurant that is a local favor. It is 5 minutes from the hotel. It was the best meal. Our group enjoyed it very much. We love all the guide. They are all great guides. Cars were always clean and driver always there on time. No problem at all. Carol from Xian was exceptionally good. She was always there checking on us during meals, very knowledge about Xian. I learned so much about Xian from our guide, Carol, I felt like I took a history lesson. Our guide "Du" from Beijing was great too. He is funny and entertaining. Our whole group enjoyed his funny stories and we sing on our bus to and from sightseeing. Thanks all the guides for us. We have a memorable trip and they made a huge difference.